"Authentication Service Error 12057. An error occurred during authentication. Please try again. I uninstalled NIS and went to a restore point before my attempt to install, and the dialer worked just as it should. I have since installed NIS9 again and again the dialer stopped working correctly. Everything even remotely connected with AOL has permission to connect, so I don't know how what's going on -- or how to fix this...any ideas? Other than this minor quirk everything is working just fine -- it's an EXCELLENT program! 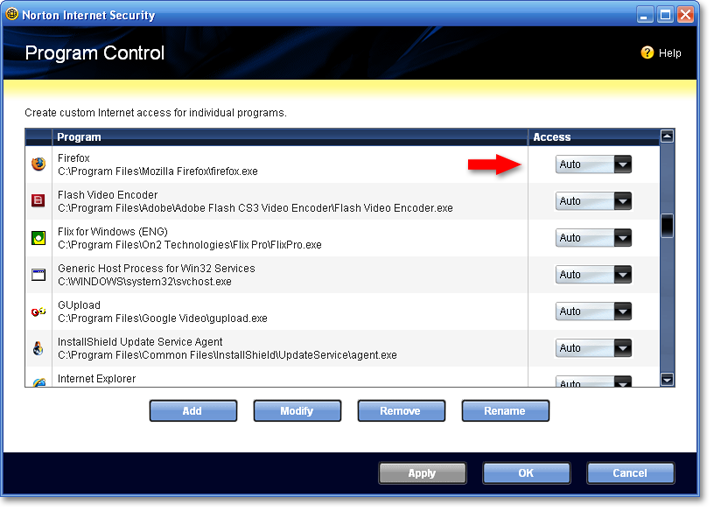 Open the main Norton interface, click on Internet Settings and scroll down to Smart Firewall > Program Control > Configure. In the Program Control window, look for the program you are having a problem with and see if it is set for "Auto". If so, then select "Allow" from the drop-down box. Click Apply and OK your way out. Excuse my English. I am using a translator. Arrive here looking for the solution on google. Not as find. As got to fix it, tell him to see if it helps. I have Windows XP SP3. In the Control Panel -> Network Connections -> Properties of your network card. In the Authentication tab uncheck "Enable IEEE 802.1X authentication" to disable IEEE 802.1X authentication. Now try to connect to the AOL Dialer. PMJI but you don't have AOL's MacAfee security software installed do you or if it was installed how did you remove it before installing Norton. There is a special cleanup tool for many brands of security software, including one that MacAfee offer but I don't know if there is one for an AOL branded version. AOL has a support page with steps to troubleshoot the 9.1 software when it hangs at step 4. Since the Norton Firewall is set to allow AOL, it could be one of the other possible causes discussed there that is responsible for your issue. Hope this helps you track down a cause. I do not have the AOL-sponsered Macaffee Anti-Virus installed -- never did, never will. I do not let AOL install ANYTHING on my computer; they are not to be trusted. My prior AV program was AVG, which I completely removed (as prompted) to install the NIS client. Try to remove the entry for AOL Dialer from Program Rules in Firewall Settings, then add it again. Set it to Allow all connections. I got the dialer up and running...it was "Walterperu" above who's idea put me on the right track. "Check for publisher's certificate revocation"
"Check for Server Certificate revocation"
It feels more like a workaround than a solution because it seems to be leaving me more vulnerable, so I would certainly appreciate anyone chiming in if they see any dire consequences to what I did...but for now -- it works! This is not the first situation where uninstalling Norton removed the problem; installing Norton and it came back -- and others I have had it with a Context Menu situation where a system running Norton 360 V1 was OK but updating it to V2 and a utility called PowerDesk, a better file manager than Windows Explorer, promptly crashed; revert to V1 --- OK; update to V2 same result. But eventually it was discovered that Microsoft had changed a protocol in Windows that they expected everyone to follow but did not immediately adopt themselves. Then without telling anyone Microsoft adopted their own new protocol. Programs that worked with the new protocol version worked and and so did programs that used the old protocol -- it needed old and new protocols both present to cause the crash. It was almost impossible to persuade users that it was not Norton's fault since it only happened when Norton was there but although I had no chance to use it I came up with the following parable! I live in a city called Microsoft which had a traffic department that decided to turn some of the city center streets into one way streets. I read about this in the papers and the next time I drove through town on my normal route I saw that it was indeed One Way when suddenly I was hit by a car that came out of a side street and turned as he used to be allowed to but was now against the traffic flow. The driver said he didn't know about the new one way system and said there was a van parked at the corner and he certainly did not see any warning signs. Now suppose there had been no traffic at all going the correct way -- the other driver could have driven the wrong way and not had a crash. And if I had been driving along the right way and he didn't come along I would not have had a crash. But if one was doing the right thing and the other was not then the crash occured. So who was responsible for a crash? Whether you blame the other driver or the City transport department it was not my fault! BTW Are you sure you have to use the AOL dial up utility? You say you are not using AOL software .... I'm not on AOL itself but I am active on Compuserve which belongs to me and recently became more integrated at the ISP level and while I am on broadband I have not heard of dial up users having to use AOL software. P.S. regarding "...if I could get away without an ISP..." Any ideas? Dealing with the last PS first -- if I understand what you are saying and we are both using ISP in the same sense then I don't think you can get onto the internet without an ISP (unless you squat in Starbucks with a wireless laptop? <g>) ISP means Internet Service Supplier. Ok next bit -- do I take in that you are using AOL Dial up because there are no Broadband connections in your area, like through your cable TV company ( my route) or phone company which many use with a non-dial up "always on" DSL connection? If you are using dial up because that was what came when you began subscribing to AOL (I go back about as far with Compuserve <g>) then you don't have to use dial up to access AOL -- you can access it via another ISP is my understanding and is certainly the case with Compuserve since when my cable broadband service became available I began to use that and a while back one no longer had to pay Compuserve in order to access their website. Has that happened with AOL -- you should check this. I think it is true since if I go via my broadband ISP to AOL.COM I can see their pages. https://new.aol.com/freeaolweb/?promocode=814336&promocode2=805966&ncid=AOLAOF00020000000680 has information about this but the important thing to do first is to find out if you can move your present email account over onto the free AOL mail without losing your address. If you can then you shold be able to stop paying AOL monthly and get your email and other AOL pages via that ISP using your normal browser -- I get my Compuserve mail via Outlook Express at the same time as I get my email from my address with my broadband ISP. In addition there is a service called Web2Mail which enables you to pick up your email anywhere you may be even using public computers, not your own and so if you can get your existing email address onto the free AOL mail you can have various ways of accessing it. So there is a lot you can do if you do a bit of asking around!